Matchbox. The brand does not need an introduction. And besides that there are much better websites with summaries, listings, even about boxes only, and there is a club. Thus what else do we have to say here? 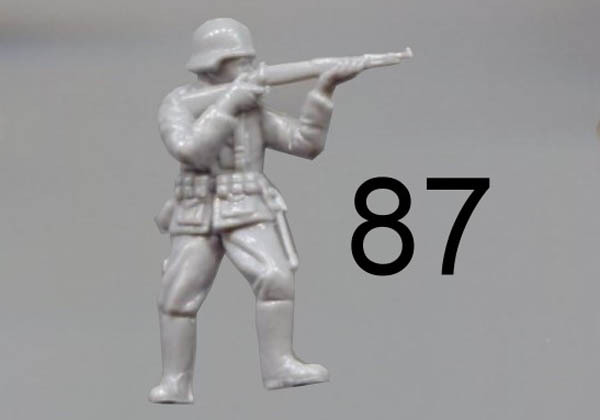 Well, this is a website about plastic soldiers and figures, and Matchbox made 118 different poses of them in their 63 years of history. This does not include the regular soldier boxes, elsewhere mentioned on this site. 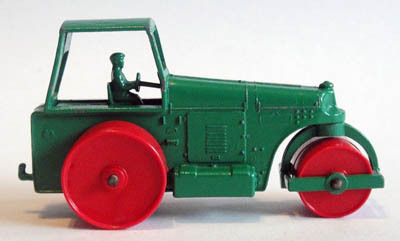 The very first Matchbox vehicle produced, the 1953 number 1a Road Roller, included already a driver, although of course not plastic. So Matchbox made a proper start right away! This article will be about ALL other figures ever produced by Matchbox. 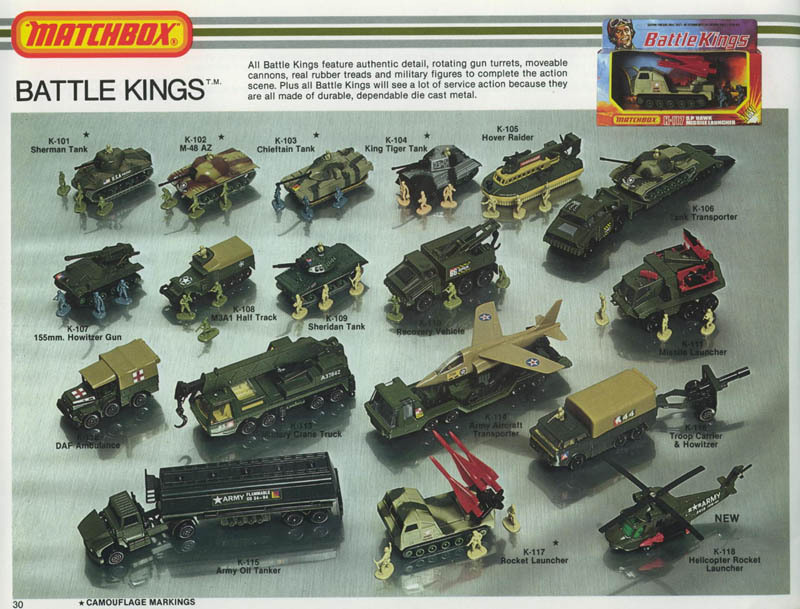 A complete list of military vehicles produced by Matchbox is included as well. Although that is not the purpose of this website I know that most of you are military enthusiasts or simple and straight forward war gamers (like myself), thus vehicles might be of interest. But let’s start with an overview of the past decades, the different ranges and the number of different figures produced. Please understand that Matchbox produced mainly die cast model cars, and thus many drivers. These drivers are often depicted as strangely formed humans, and these are mostly not included in this article. Besides that pre-painted and other scale figures are not taken into account as well. These include 30-35mm figures, pre-painted and not taken into account in this article. There are 18 sets with figures, in total 22 poses. Various vehicles, some with figures. These 9 boxes can be found on the Matchbox Listing page. Not discussed here. Based on Buck Rogers, out of scale but interesting. With the same figures as super kings above. Not taken into account. With 5 pre-painted figures. Not taken into account here. Various new stuff, but only one with figures. Large range, and 5 with figures. Large series with many figures. 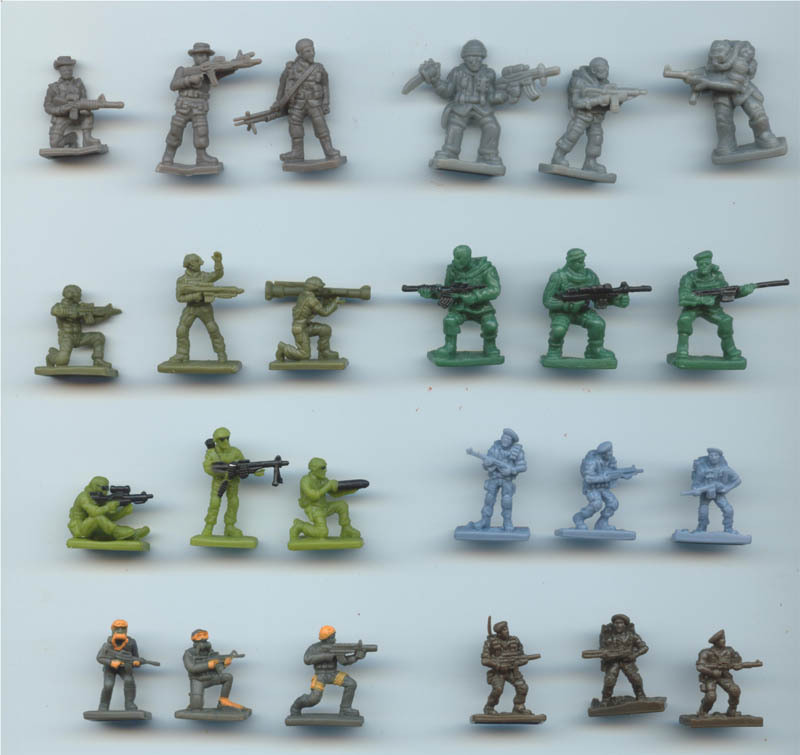 Pre-painted figures, around 28mm and bulky. 17 sets with 24 human figures. Not taken into account. All model kits that included figures. There are 16 kits with figures. Regular series, and the history of MB in the last decades. What happened after 2006? A short summary. How did this all start? Well, indeed Matchbox started their production in 1953 with only a few models. And some of them already have drivers (mostly casted in metal, together with the rest of the vehicle). This continued till 1957. These were produced in what we call the 'regular series'. The regular MB series were numbered 1-75 for many decades to come. But each year new cars and vehicles were produced replacing older models with the same numbers. This means that, for example, the number 2a mentioned below will not be same vehicle some years later. Some numbers are used up to 10 or more times in history! Some vehicles with drivers we will show here, and below you will find a list with all the models that included drivers. It was in 1958 that Matchbox seems to realize that military vehicles might be a market. Thus they produced 3 vehicles in 1958 and a further 9 in 1959. That was an interesting output of 12 vehicles in total...but without any figures! Most of these military vehicles mentioned were also presented in Gift set G5 (with 8 vehicles). MB 49a M3 Personnel Carrier (1958), the first military vehicle! 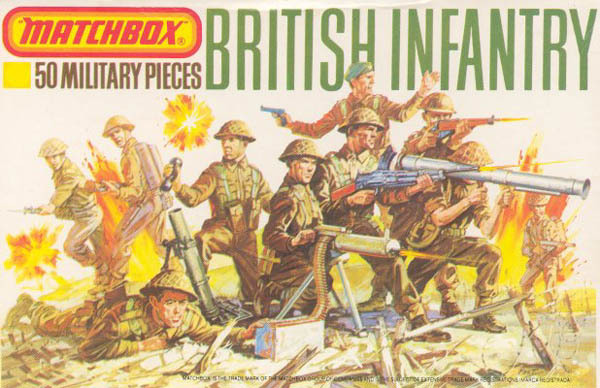 In this period Matchbox takes the first steps into toy soldier and figure land, maybe inspired by Airfix. First they produced the 'Lyons Maid Ice cream car' (1963), with a half-figure, and then the 'Horse drawn fire engine' with 3 plastic sitting figures (1964). At last, finally a set with a standing figure: the 'Studebaker Lark Wagon' with hunter and a dog in 1965. After this period all was quiet till 1973. The older vehicles were re-released. MB 47 Lyons Maid Ice cream (1963), with half a figure. MB Y-4 models of yesteryear. Horse drawn fire engine (1964). With the first real figures! 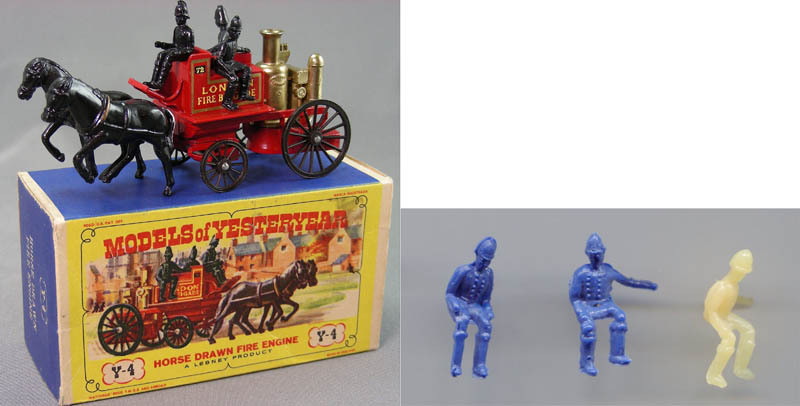 See also my other article on the PSR website about the Lledo Days Gone range, where a similar fire engine and figures (copies) are presented. The cheaper copies of the figures on the right picture are probably from the Lido copies. MB 42 Studebaker Lark Wagon with hunter and dogs (1965) with the first standing figure! 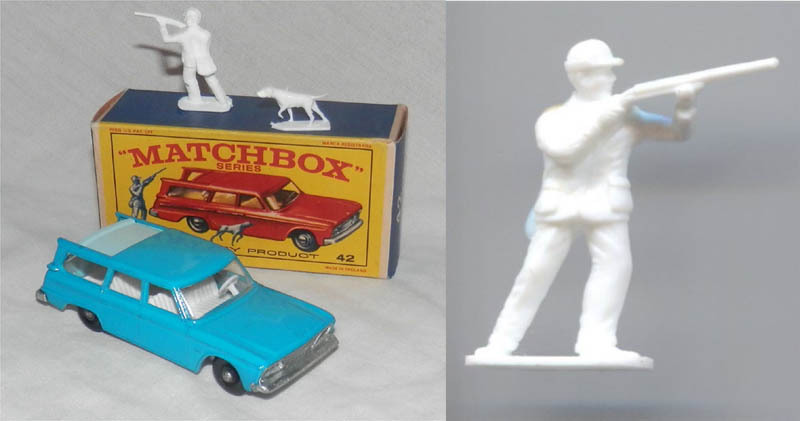 After the initial military vehicles in the previous decade and the first tests with casting figures Matchbox decided to think big. It seems that military toys did well in these years, thus that seems to have helped a lot. As a consequence Matchbox started to produce two larger ranges with military vehicles and soldiers: the Battle Kings range and the regular vehicles in the Superfast range (chapter 4). 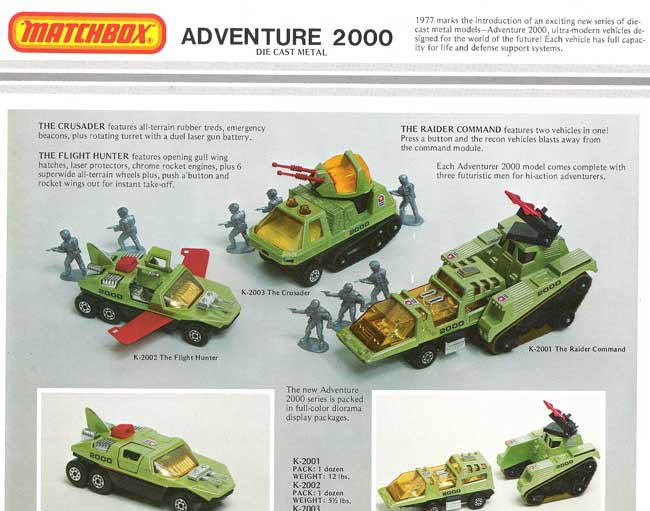 Later, in 1976, they also produced the regular Matchbox soldier boxes (chapter 5), to accompany their large range of vehicles. The Battle Kings series started to appear in 1974 and continued till 1979. Catalogues, displays and box-backside advertisements cannot be trusted with regards to what type of soldiers are included in which set. Packaging of soldiers seems to have been completely random. I have seen the same sets with different soldiers! Sometimes enemies, sometimes not. But in all boxes you will find 3 soldiers. Some soldiers are more often included than others and some of the British troops are especially hard to find. Below is the list of vehicles, some have half figures or commanders in the turrets. And here are the soldiers that came with the vehicles: 6 British poses, 3 Germans and 6 Americans. The plastic is very fragile, weapons are thin and breaking easily. 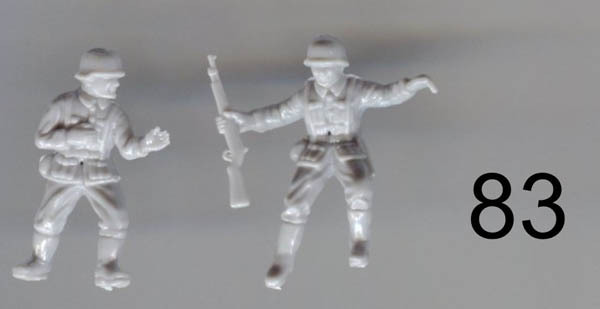 Experts will recognize certain poses, because they are copied later in the normal soldier boxes, but with different (much smaller) bases. 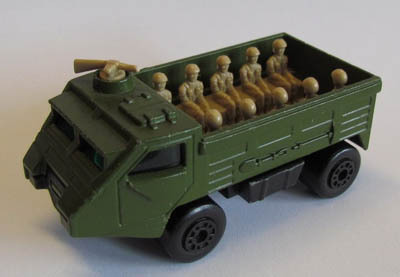 In 1976, Matchbox included most of these figures, and some regular Matchbox vehicles (see chapter 4) in the PS-2 'Beach Head Assault' playset. 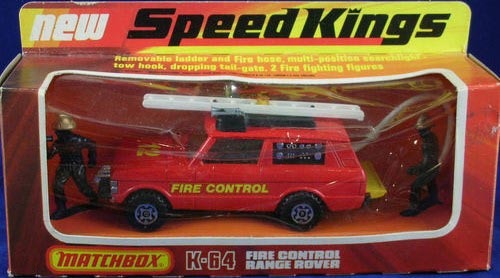 The range 'Superfast' was not a complete range in the true sense of the word, at least not like other Matchbox ranges. It was basically a branding name. The term Superfast was first used in 1969. In some years there was really a superfast range, with their own numbers. In other years the same vehicles were included in the normal MB regular series, or other ranges. Are you still following? Anyway, between 1975 and 1979 a total of 21 military vehicles reached the market. The complete list can be found below. The picture below shows some of the vehicles. MB 28 and MB 30. The look-out in MB 28 turns around if the vehcile drives! 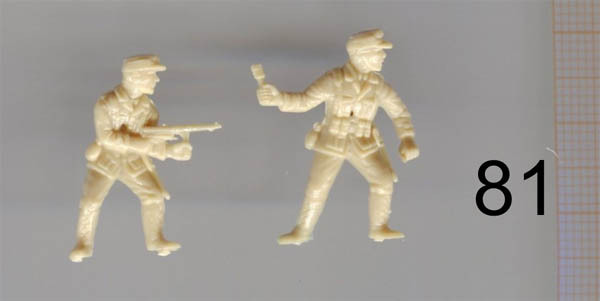 MB 32, with the same figures as presented in the Battle Kings Range, but on a strip. Superfast 3 Mercedes Ambulance (TP 14). Superfast 28 Mack Dump (TP 16). Military Truck and trailer (TP 15). Many of the above are also included in Gift sets; G4 'Military Assault' and G11, 'Strike force'. 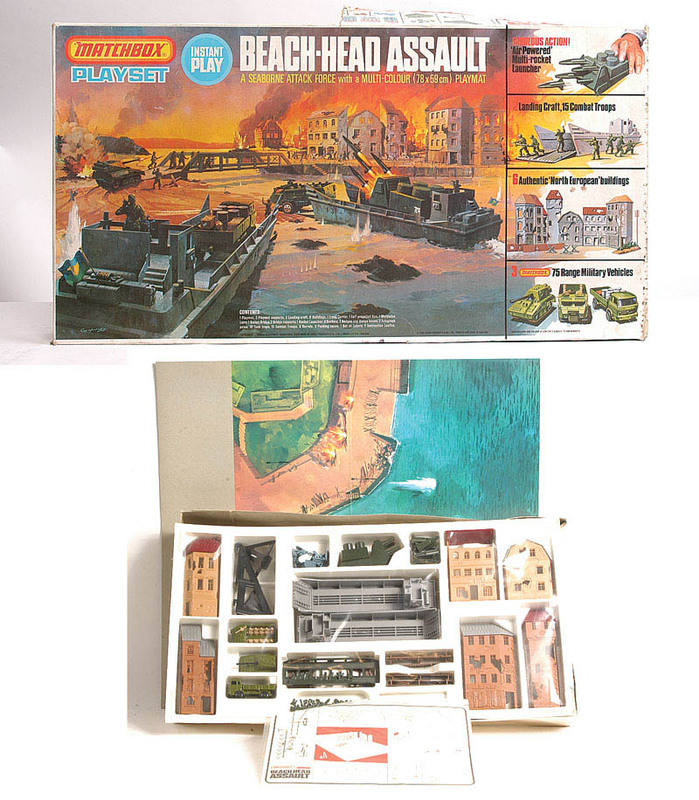 Some are also included in the playset ; 'beachhead assault'. 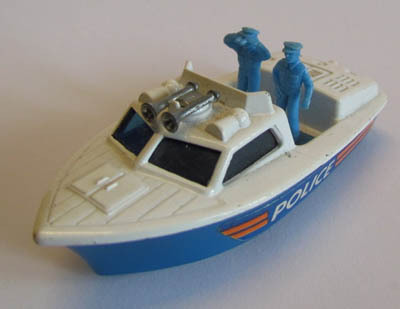 Superfast 52 Police boat (1976). With two nice 1:72 figures. You can also take them out of the boat. These 9 boxes can be found elsewhere on this site. Not discussed here. 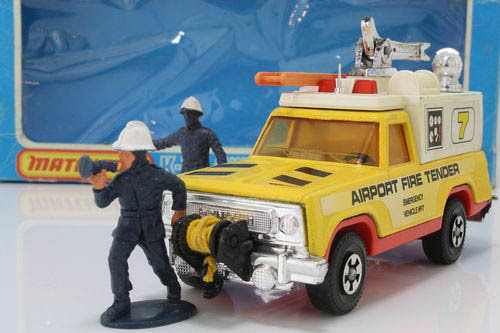 In 1979, Matchbox included some of these figures in the 'Rocket Attack' Play kit (number PK-1002). This set is discussed on this site by Victor Rudik here. This was a small range based on the Buck Rogers saga. There were 3 vehicles and 3 figure poses. The figures are too big for our scale (around 35 mm), but nevertheless interesting to mention. Another strange thing with this range is that the same figures are also used in the playset 'Buck Rogers in the 25th Century', produced by HG Toys in 1979. In that set many more figures were included, (by the way, there were 8 humans, 6 robots and 3 space commandos). The space commandos are the same 3 as above. It seems that they bought the figures from Matchbox, as this set was produced later? The Buck Rogers in the 25th century playset, with on the right the figures (thanks to Toy HQ!). With the same figures as Super Kings (chapter 3 above). 30-35mm so not taken into account. With 5 pre-painted figures made of tin (metal), 8 vehicles/aircraft, 2 playsets and of course some dinos. Although the figures have the correct scale, these are not plastic. Thus they are not taken into account here. While Matchbox released all these series mentioned above the normal MB regular series continued all the same over these years. Nevertheless all was very quiet on the military front. Between 1979 and 1993 hardly any new military vehicles were produced. Perhaps this was because MB was working hard to expand their range of regular soldier boxes (see chapter 5)? New vehicles were only produced between the Iraq Gulf wars. The only vehicle, or actually a boat, that included some suitable 1:72 figures in this period is the MB 36 Wave King (1999). This was a short series of 7 sets, similar in size and occurrence. Not all of them are called 'adventure' playsets, but there seems to be no other common name for this range. The figures are 1:72 in scale although a bit bulky. 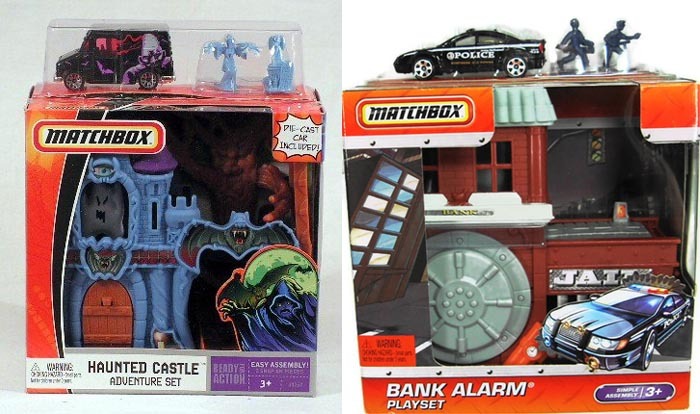 Bank alarms playset. With 2 figures in dark blue. Burger Zone adventure set. With 2 figures in white. Cars wash playset. With two figures in purple. Haunted castle adventure set. One ghost and 1 grave in light blue. Shark pier playset. With 1 figure and 1 bird in yellow. Police action adventure set. Without any figures. Junk yard adventure set. Without any figures. Sky Buster is a big range of military aircraft. Many sets were produced. And in 2008 some of these planes were combined with various vehicles in playsets, together with some figures. 5 sets were produced as such, and a foldable play mat and some extras (like a tent, sledge etc) were included as well. Every set included 2 figures, which are size 1:72, although a bit bulky. Set 1, 4 and 5 are rare, and can be very expensive. It seems not many were made. Highway Rescue, with yellow figures and a first aid bed. Test Flight, 1 standing grey figure and one sitting behind computer + extra supply car. Blizzard expedition, orange, with extra sledge with supplies. Amazon adventure, sandy colour, with a tent. The famous Battle Kings series from the past, mark II. MB/Mattel made some real effort to make this a substantial range. Even so much that we need to include a table to keep track of things. There are 26 sets produced, and three special Chinese additional sets. 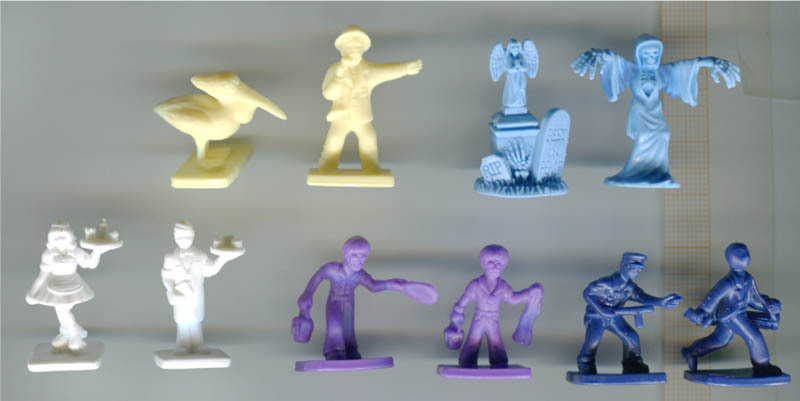 All sets had 3 figures included, but many are doubles, figures are the same in several sets but were produced in different colours. The first two sets, 'Battle Station' and 'Command Center' are larger playsets. Regular sets are much smaller and have, besides the figures, normal MB vehicles and aircraft included, besides some extras like bunkers, flags etc. From left to right, set 16, 23 and 26. Below is the complete line up, with indication where figures are repeated and doubles, compared to other sets. If you collect the 9 sets marked in bold, you will get all the figures in the end. The last special set, is not produced by Matchbox, but clearly comes from the same factory. They are distributed by Greenbrier International. 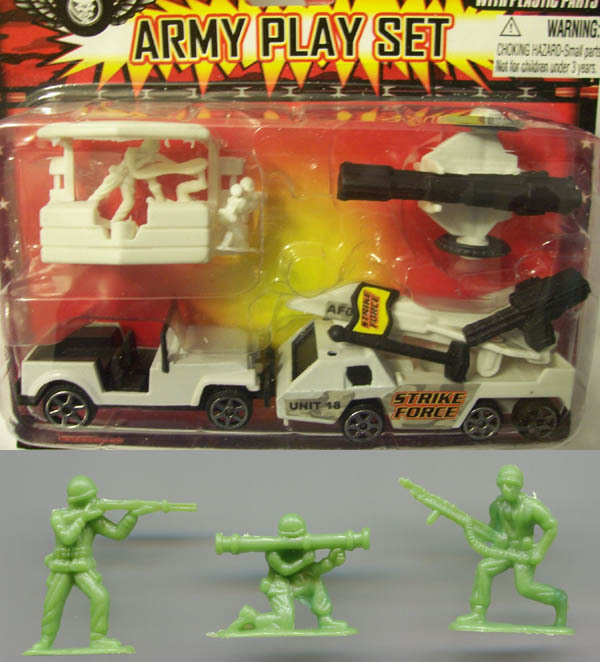 There were actually 3 of such sets, all called 'army play sets', and they came with various vehicles and aircraft as well. But they had the same 3 figures (in different colours). 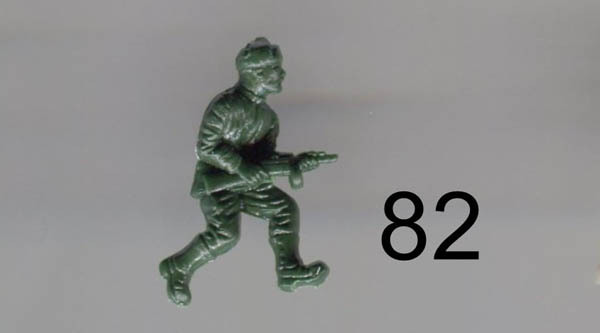 Mostly pre-painted figures, around 28mm and bulky. 17 sets, with 24 human figures. Not taken into account in this article. The first appearance of Matchbox model kits was in 1973 when they appeared in the Matchbox Collectors Catalogue. The first plastic model kits were a range of twenty aircraft in what was to be known as "the purple range" numbered PK-1 to PK-20. From the start Matchbox kits were designed to be attractive to the younger modeller by casting them in multiple colours. Already in 1974 the plastic model kit range had grown so much that a separate catalogue appeared "Matchbox Kits Catalogue 1974-75". In a few years' time the model range had grown to over 30 models in the two-coloured purple range and extended into many other ranges of larger aircraft and ships and vehicles as well. In 1979 Lesney bought AMT, after which we saw combined AMT/Matchbox catalogues appear. For more information visit this excellent website about the Matchbox model kits. There are 16 Matchbox model kits that include figures. All, except one, are also re-released by Revell in later years. Thus the list below might as well be used for Revell, as there are only a few more Revell sets produced besides the ones below. The list below only shows the model kits with figures. Set PK 75 and 88 are not included because they only include a driver or parts of a figure. All kits are correctly up to scale. They are suitable to use for any wargame, diorama or model. Most kits are still easy to obtain in the Revell edition. But getting the figures without buying the kits is troublesome. Thus you probably end up in buying, and building, the enormous 'Flower Class Corvette' set in the end! 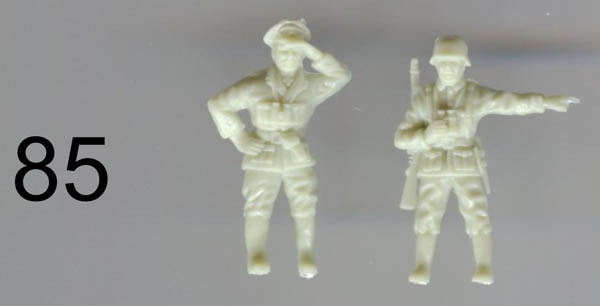 With PK 76: The 3 figures included are copies of Battle Kings Germans! With PK 83: Revell 3173 (with the same name) is a new model, not the same. With PK 85: Italeri and dragon made models with the same name, but these are different models. No re-release has ever been made from this kit. The figures from PK 901, the Flower class corvette. This kit contains 6 poses and 12 figures. It is also known as the Revell 'HMCS Snowberry'. This is truly the mother of all 1:72 battle ships, as there is no bigger ship available on the market. Many modellers are re-building this model into a Radio Controlled ship. Below are the figures from all the other sets. Numbers refer to the PK numbers above. Short history of Matchbox in the last few decades (thanks to this website). In 1973 Jack Odell resigned as director, but remained as deputy chairman, leaving Leslie sole director. 1973 also saw many new products including "Rolomatics" which had parts that moved as the wheels revolved, an 8 week strike, a fire then a flood which destroyed much of the Rochford factory, and the cessation of yesteryear production until 1975. In 1974 Lesney diversified into dolls. In 1977 Lesney acquired Vogue Doll Company, and in 1978 it acquired AMT, maker of plastic model kits. AMT was sold to Ertl in 1982. By 1980 Lesney was feeling financial strain. Jack Odell came out of retirement as joint vice-chairman in 1981 for a year, and David Yeh of Universal Toys struck a deal to manufacture Matchbox toys in his far east factories, one of the first being the Disney character figures. Manufacturing in the far east proved too costly and ceased. 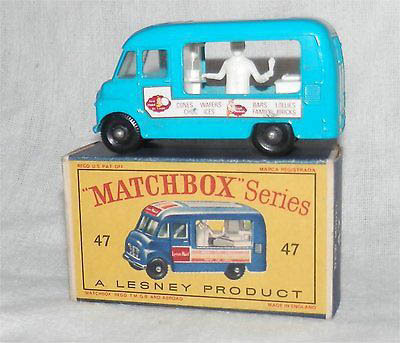 After suffering huge losses and under pressure of creditors, on June 11, 1992, Lesney was declared bankrupt, a receiver appointed, the company was reformed as Matchbox Toys, Ltd., and a buyer sought. Fisher Price and Mattel were possible buyers, but Universal Toys bought the company and the marketing companies for France, Germany and Australia, for £16.5 million on September 24, 1982. Jack purchased much of the company's tooling and machinery and formed Lledo ("Odell" spelled backwards) and concentrated on limited models in the larger scale. At that time much of the Matchbox production was moved to existing Universal plant facilities in Macau. Yesteryears production stayed in Rochford, England until 1985, when it also moved to Macau. Matchbox International Ltd. (later Universal Matchbox Group) was formed in Hong Kong in 1983. Lesney Products still appeared on toys until as late as 1985. In 1986 the company changed its name to Universal Matchbox. During 1986-87 (1985-86) production was moved to Macao. In 1987 the Rochford factory in Essex closed. In 1987 Universal purchased the "Dinky" trademark from Kenner-Parker. Six miniatures were repackaged as Dinky cars to preserve the mark, and in 1989 the first prototypes appeared. In 1990 new facilities were opened in China for Yesteryear production to replace the Macau facilities, and production was moved in 1990-91. Throughout the 1980 unusual toys other than die cast appeared, including Pee Wee Herman and Freddie Krugger. In July 1992, following financial downturn, Universal Matchbox Group Ltd. was sold to Tyco Toys, Inc, New Jersey, USA for just over $100 million USD, and in October it was merged with Tyco. Late in 1992 Tyco formed the Matchbox Collectibles division to be responsible for sale of Yesteryears. On November 18, 1997 Mattel purchased Tyco for $755 Million. The MB brand is still owned by Mattel today. From 2006 only 'concept' military vehicles were produced that are not based on existing modern vehicles. These are more fantasy like, and are nowadays of course attractive to children. 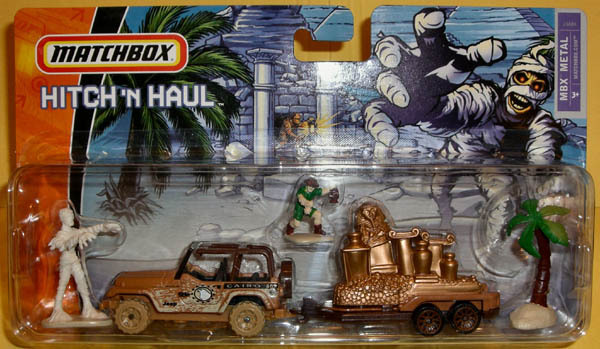 Many of these 'tough' vehicles can be found in the 2006 Battle Kings series and one in the Hitch 'n Haul series (the 'army camp' set) . In the regular MB series the 4 vehicles displayed below are produced since then. None of these new vehicles included any figures. If you want to see the current production then browse through the listings here. If you have any remarks or suggestions feel free to email me.